One Of These Things Is Not Like The Other….. The whole thing is heartbreaking and beyond belief, 'Suffer little Children' is right. The sad thing is we live in a very young parish and we have the most wonderful young priests who are totally modern and giving. They operate in a totally apologetic manner and have spoken strongly about their views on the scandal to much applause and tears in our church. It is disgraceful that good men like them are being tarnished with the sins of the fathers,so to speak. I am no religious person but I believe in 'goodness' and really hope that this scandal will bring a total reform of the big corporation that is the Catholic Church and that the good people on the ground will take over and start afresh. Thanks for your thought provoking post. Well said Barbara. I am at a loss to find the words to express my disgust at the revelations of the past years. We can only hope this will teach the church, but I fear the lesson is falling on deaf ears and yet I agree with Brigid. I feel for those innocent priests, being tarred by the same brush. The culprits of these crimes must be brought to justice, with the stiffest of penalties. Very well said Barbara, I have no pity for anyone involved in the structures of the church, they are adults and know full well what they are involved in. There were possibly thousands of people who knew what was happening down through the years, they stood by and did NOTHING . They are the ones who with the bishops need to get out and stay out of organised religion if they don't have the courage to effect change where it is needed. As for the garb of the senior clerics – they take their lead from Rome. It is frightening how rich the church is – a visit to the Vatican museum where a little of their riches are on display would harden anyones heart. I agree one hundred per cent that Jesus would not tolerate what has gone on in the Church. Ater all it was He who rid the temple of the money-lenders and by the sound of it he was fairly robust in the way He did it. I also think that Brigid's comment was terrific as she highlighted the plight of the young priests who are coping with an impossible situation not of their making. Hi Brigid and Ann and thanks for your comments. Brigid you make a good point – there are of course good priests in the church. We too have one in our Parish.. but I can't help but feel that most of them, although they may understand the enormity of the crimes committed against children, they still don't understand how the cover up by the church was just as wrong. That's the bit that now I find just so hard to get to grips with. Evil is born when good men do nothing. Welcome Deirdre – first comment on my blog… and you express the anger that we all feel very strongly. And yes Noirin, Jesus didn't hesitate in throwing the money lenders out of the temple. One wonders if he came back today would his first stop be the Vatican where he would evict all the hierarchy and sell the treasures and art to provide for the poor! Gosh, Barbara, this comment is a bit light considering the subject matter on this post..um..but are you the Barbara who was my 100th follower? Because the link didn't match up and the photo is different on the follower than on your comment. Cause if you are, congratulations, and if you aren't, I'm not sure who that Barbara is! Hi Karen and thanks for your comment. This post was not meant to be 'light' at all but so much has been written here about the issue of clerical child abuse that I merely wanted to focus on one particular element. Perhaps I wasnt as clear as I wanted to be..but my point was that the courage and dignity of these ordinary men and women – survivors of child abuse – is in stark contrast to the pomposity of the hierarchy with their fine robes and mitres and staffs. For all their finery and wealth means nothing and is very far from what Jesus wanted his followers to do! Really sorry that you felt it was 'light' – this is one subject that I, esp as a mother, would not treat lightly. And yes I am same Barbara – Google and I don;t get on that great… it bamboozles me a lot of the time.. I will try to sort out my identity crises!!! Barbara, What I meant was that my comment was light. Certainly not your post. Sorry for the misunderstanding. I applaud your courage in tackling this issue, and you did an excellent job with it. But at least I found my winner! I thought it was you, but wasn't sure. Email me at vizat10atyahoo.com with your book choice and your address, and I will send it on its way. Well-said Barbara. It really is a crisis so I suppose all that people who have faith can do is hope for change. 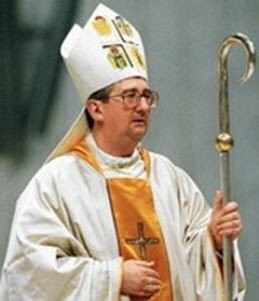 I was surprised that the bishop resigned today but maybe its a sign that things will change. I'm so cynical but hope to be proved wrong. PS I'm reading the Other Boleyn Girl, the author talks alot about the clothing and the significance of the pomp/ceremony. It's definitely used to overawe us – not as effective these days but you can imagine the fear felt by young children 50 years ago. OMG Karen – lesson 1. read ur comments properly. U did say comment and not post! Lesson 2. I need to abandon my inferiority complex/persecution complex… just assumed you were being 'creatively constructive' I am not mortified. But thanks for clarifying!!! And I will email you.. I also didnt realise I was the winner – thought you were just picking one of the comments. Wow – I really must do better!!!!! But delighted to win your book!!! Hi Niamh… thanks for ur comment… must check out Other Boleyn Girl… The Law (judges etc) and The Church dress to intimidate mere mortals!! !